"Just a short boat ride to spectacular jumping tarpon." We guarantee you'll catch a tarpon! Our Florida Keys fishing charters offer you high quality Florida fishing vacations and great light tackle tarpon fishing adventure. Choose from three different tarpon trips tailored to fit your interests. 1. Our most popular trip. Our Bahia Honda bridge tarpon fishing charter is comfortable and safe. This is a favorite with our return guests and the trip we recommend to families and first time tarpon anglers. March through June 15. 2. If you want some "tarpon insurance" try our finest guaranteed trip. We're so confident you'll catch a tarpon we'll give you a free trip if you don't! April 15 to June 15. 3. For the anglers looking for some light tackle action or a chance to catch a monster try our Mixed Bag tarpon trip. This trip is featured on In-Fisherman TV. You can catch tarpon and other really big fish most anglers only dream of. February through May. Beginner or expert you can get in on the action. We practice "hands on fishing," you hold the rod and you catch the fish! Trips depart at 5 AM or 5 PM. No extra charge for additional anglers for up to 6 passengers! Our most popular tarpon fishing charter! Everything is provided. The live bait and tackle is already onboard so you get the most fishing time possible. This is a very comfortable trip and a great opportunity for you and your friends to get away from the crowds. Experience some spectacular saltwater fishing without a long boat ride and rough waves. No one gets seasick and, for the ladies onboard, clean indoor bathrooms are quick to get to. Your trip departs from our dock on the island of Bahia Honda Key. It's just a 5 minute boat ride to the sheltered waters of the famous Bahia Honda bridge. Thousands of big tarpon migrate through this area every spring offering you some of the best tarpon fishing in the world. Catch a tarpon or fish free! 4 to 5 hours April 15 to June 15. Tarpon fishing so good we guarantee it! On our best day we hooked an incredible 40 tarpon in 4 hours. After chasing these monsters for 20 years we know how to get you a big fish. Even beginners can catch a tarpon on this trip. We give you a full 4 hours or more of fishing time and plenty of live bait to guarantee you the best chance of catching a big tarpon. Be in shape, we guarantee you'll catch at least one and if they're hungry you'll catch a bunch! We guarantee you'll catch a tarpon but be ready for a fight, landing that monster is up to you. 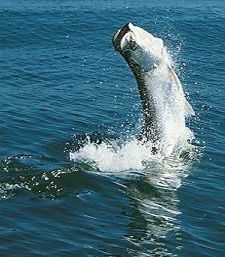 We usually catch several tarpon on every trip ranging in size from around 60 LBS up to 200 LBS. Tarpon are tough, some jump and throw the hook and others are fought for hours. We take you to the tarpon, you hold the rod, you catch the fish and you fight the fish. Because of the tarpons incredible fighting ability even the best anglers don't land every fish. We do everything we can to help you but we're sure you understand we can't guarantee your ability to land a tarpon. We hook at least one tarpon per trip guaranteed.. fighting that fish is up to you. It's a simple deal and a great guarantee, if you don't catch a tarpon we take you fishing again free. We invite you to redeem your free Bahia Honda bridge tarpon trip at any time, even two years later, or give your free trip to a friend. Reservations are required. Please note: Extreme weather and cold fronts will turn the tarpon off. If our guides think the weather conditions are too bad we will cancel your guaranteed trip and refund your deposit or take you fishing another day. "get a really big bang for your buck!" For fast action and big fish you can't beat this trip. Enjoy sight casting to 100 pound tarpon, catch large 500 pound plus hammerhead sharks and 300 pound bull sharks, 100 pound and up Goliath grouper and smaller 5 to 20 pound permit, snook, barracuda, snapper, gag grouper and jacks. Fish aboard our best boat with plenty of live bait. Enjoy safe inshore fishing, calm waters and lots of action. Hang on to your fishing rod.. don't miss this trip! Catch some of the tastiest fish in the ocean! Additional fuel charges for trips over 30 miles may apply. WRECK: Add some variety to your Florida fishing. Anchor up and chum the wrecks and man-made reefs of Florida Bay and the Gulf of Mexico. Use live bait and light tackle for a fun day of fast action. Catch over 20 kinds of fish including cobia, snapper, trout, grouper, huge jewfish, mackerel, kingfish, jacks, tarpon, permit and 7 kinds of sharks. REEF: Head out to the beautiful coral reef on the Atlantic side for some deep water Florida fishing. You can drift, troll or anchor on the reef edge to catch sailfish, dolphin, kingfish, wahoo, amberjack, bonito, mackerel, snapper, grouper and sharks to name a few. Fish for over 50 kinds of fish from 1 to 1000 LBS on 12 LB to 100 LB monster rigs. Test your light tackle skills on smaller sharks or rig up some heavy tackle and yank on a monster. The most common species in the Florida Keys are bulls, blacktips, hammerheads, lemons, bonnets and nurse sharks. The big boys like big bait and catching bait can be as much fun as catching sharks. Big sharks are very strong and can fight for hours, be in shape! Sunglasses, sun block, brimmed hat, long sleeve shirt, light jacket or sweatshirt, non skid shoes with souls that won't mark our decks and your food and drinks. We provide coolers with ice, Florida fishing license, live bait, boat and fuel, a great selection of tackle, an experienced Coast Guard licensed captain, fish filleting and free guarded parking at Bahia Honda State Park .